Don't Be Afraid of Cream Blush! So this is just kind of a fun post! I thought some of you might be like I was not too long ago: fearing cream blush! I wanted to dedicate a whole post to it because I’ve recently discovered the magic of a cream blush (vs. powder) and I had to share!! I used to hate the application of any that I tried and I’ve realized my mistake: I was using my finger. If you have a stiff brush blush on hand, problem solved!! Now, one of the benefits of cream blush in your handbag is that you can apply it with your finger in a pinch! But at home, I like to use a stiff angled blush brush (this one is the BEST) and it takes two seconds. Literally goes on like a natural flush and blends super easily! I now prefer cream blush over powder formulas. Powders can tend to sit on the skin and look unnatural. With a cream blush, it blends so much easier into the skin and won’t sit in fine lines like powders. I hope this inspires you to try something new today!! I promise you’ll love it! Kjaer Weis Cream Blush - I have shades Desired Glow, Precious and Blossoming. Beautycounter Color Pinch Cream Blusher - I love the shade Caramel! A great dupe for the Kjaer Weis Desired Glow. Vapour Aura Multi Use -I love Courtesan! RMS Lip2Cheek - I love Smile for a pop of color in the Spring! Concealer: Vapour Illusionist Concealer (Get 10% OFF with code ROSEWATER) I wear shade 015. I’ll be the first to admit: I do not do this nearly as often as I should for my personal brushes. However, when a patch of dermatitis popped up on my face this winter, I feel pretty certain that I can point to my brushes as the culprit. When you don’t wash your brushes enough, they can harbor bacteria…which can lead to breakouts or rashes! It’s so easy to do, I’m sticking it on my calendar reminders to make sure I am keeping them clean! Fill a couple of cups or jars half-full with warm water and a squeeze of cleaner. (I use this, but this is another great option! Put your brushes in the cup, brush fibers facing downward and submerged in the water. Swirl each brush and let soak for a couple of minutes. 4. Put your brush cleaning mat in the sink and run the warm water. 5. Take each brush individually and swirl on the mat. You will start to see product coming off onto the mat. Alternate swirling and rinsing in water until the water runs clear and there is no longer product coming off of your brushes. 6. Lay on a towel to dry. This can take up to 24 hours, depending on the size of the brush. Don’t forget: the type of brushes you use can change the way you apply your makeup! Below are some of my favorites! Use my code ROSEWATER for 10% off of your Sigma Brushes Purchase. My husband and I don’t take Valentine’s Day very seriously (I’m not even sure we will go out) but ever since I had Chapel, I look at it as something fun and themey to do with the family…and I love any excuse to give or receive a treat or two! I started a little tradition where I make these Paleo Chocolate Donuts in this pan. (A really cute mini heart pan option) This year, I’m going to serve them up for a family breakfast in bed (may be a bad idea with a toddler??). I love these breakfast trays or these. Here’s some ideas, if you’re searching for some Valentine’s treats! These brushes are a game-changer for your beauty routine. There is nothing wrong with TJMaxx brushes, however if you want quality brushes that will LAST FOREVER - these are it. I’m talking quality vegan brushes that will up your game - no stray hairs on your face, they won’t get brittle after some wear and they really do make a difference in how your makeup is applied. Plus, the metal parts are super durable, so they won’t scratch or fade. The handles are strong and coated with paint 8 times, so they stay like-new for a long, long time. Use my code ROSEWATER for 10% OFF of your purchase! Hello, gorgeous. This palette just released in late 2018 and I’ve been dying to get my hands on it. It has not disappointed. Gorgeous color with just enough sheen. You will be seeing this on me on REPEAT. Not to mention, the colors are infused with real Rose Quartz and Organic Rose Hip Oil for glowing skin! I haven’t used anything like this product. Wild actives that nourish your skin with tons of vitamins. Gentle exfoliators for cell turnover / anti-aging. And the formula looks so glowy in the bottle, that of course translates to your skin. It’s a serum and primer in one. With a pretty price tag. Just $68 for tons of health benefits either on its own or under your makeup. It’s a MUST HAVE. Pretty in Pink Lip Kit - only $25! Use my code ROSEWATER for 15% OFF of your first purchase! This is BY FAR my MOST POPULAR line among my readers! Use my discount to see what all of the fuss is about!! I love the MUN Anarose Toner and AKNARI Brightening Serum! They are not to be missed! Right now, you can receive a full-size Revive + Protect Moisturizer FREE when you purchase the Daily Face Essentials. When you use my code, you can get the entire line for $178.50!!! MVMT Sunglasses and Watches - Use my code therosewateredit15 for $15 OFF your purchase! I love my Cuyana wallet - I’ve had it for years and it looks brand new! It’s held up so well! Mine is black with a red interior, but I love the blush, as well! Maybe the fella in your life would like a Butcherbox subscription?! Or maybe you want it for yourself?! I’m loving mine!! It’s 5pm and I have NO dinner plan. Just opened my freezer, popped out two frozen Alaskan Wild-Caught Salmon filets and voila! Dinner! Not to mention, the chicken is organic and beef + pork all grass-fed. I’m OBSESSED. It’s an amazing value!! We are here. My favorite time of year. I have seen memes floating around social media about how everyone sort of loses track of time during the week between Christmas and New Years. And I love it. With less responsibilities, comes more time for reflecting on the past year and goal setting for the year to come. I’ve been doing just that and I hope you’ll join me. Living a purposeful life has been everything for me and it starts with setting intention…and then checking-in throughout the new year and at the end-of-year. One aspect that i have reflected on and begun setting goals for is, of course, this blog. In doing so, I realized that there are so many things that I want to tell you. I want to answer your questions and open myself up, so you all can understand what makes this blog tick…and what makes me tick. First of all, I want to start by answering some of your most frequently asked questions of me. Do you actually try and like the products that you share? The answer is a huge YES. Not only is that the ethical way of being an influencer, but that is my character by nature. I am not going to sell my readers things you don’t need in order to turn a profit. You guys aren’t just an unknown audience to me…you are my friends and family. LITERALLY. My friends and family read my blog and spend their money on the products that I recommend. I cannot have my mom’s neighbor or my former Sunday school teacher or my mom herself wasting their money. So those are the people that I have in mind when I’m posting. I ALSO NEED YOU TO HEAR THIS: I try SO many products that I NEVER ENDORSE. The products that you see on my blog and Instagram are truly the ones that I like. I don’t spend time posting about products that I do not like because (a) just because they aren’t my fave, doesn’t mean that it won’t work for someone else (b) sometimes I may not like a specific product from a brand but I love so many others from that brand and I’m not going to bash them (c) I have always wanted this space to remain positive. I’m not into brand bashing or talking about how if you use such-and-such, you’re going to get sick from toxins..that’s just not what my blog is about. If you are ever curious about a clean beauty product and you haven’t seen me post about it, DM or email me and ask me if I’ve tried it. I will always give you my honest opinion!! Do you receive free product? Yes. At this point, about 90% of the beauty products that I post are gifted. When I first started, I was purchasing everything on my own. As I have built my brand and readership, I am gifted most of my beauty products so I can try them for review. I have also received food, baby products and maternity clothes…but most clothing, decor, and food are purchased by me. Receiving free product in no way affects my feelings toward the product and I am not obligated to post it. I always let brands know that I will not guarantee a post, if they send product. As a beauty blogger, I need to constantly test products and the only way to do that is to have it in my possession - so it totally makes sense for brands and stores to send products for me to try. Do you reach out to the brands that you work with, or do they reach out to you? Both. In the beginning, I was reaching out to everyone. The clean beauty industry has changed so much in the last couple of years and there are so many more opportunities to work with brands, than when I first started out. Brands are seeing the benefits of working with bloggers and they are reaching out more. I still reach out directly to brands + boutiques to introduce myself. This is such a humbling business and not every brand is a good fit to work with…even if they are a clean brand. Overall, I have found most clean beauty brands and boutiques to be wonderful to work with. And I love that because this industry is still small and I am happy to get to support these small businesses by sharing them with all of you. It’s different for every blogger. For me personally, I earn income mostly from my affiliate links… and also from some sponsorships and my Beautycounter page. If you aren’t aware, affiliate links are trackable links to shopping products that I share. When you shop from my links or my Like to Know It page, I earn a tiny commission. It doesn’t cost you any more, but it supports this business of mine. If you like a product that I share with you, it would mean the world if you would purchase through my links (on my blog posts, in my Swipe-up stories, on my Like to Know it Page and in my emails). I have several followers that DM or email me to get links for products and I LOVE THAT. I am always happy to send over a quick link..and you never know..I may have a coupon code or a better price! Not only do these purchases support me financially, but they also support the relationships that I have with these brands! The more support they see coming from you all, the more collaborations we can work on together …and everyone wins! The bottom line..if you are thinking of making a purchase and it’s a product that you learned about from me, please consider purchasing from me. Even leggings or shoes that I share earn commissions, so I appreciate your support by purchasing through my links on blog posts, my emails, swipe-ups on Instagram stories, my Like to Know it page and my Beautycounter page! Please hear my heart in all of this! My goal is not to become a millionaire blogger (if so, I have a long, long way to go!!) But any work that you’re not making money from is just a hobby. And sometimes this can feel like a very time-consuming hobby. So, I want to be upfront and ask for your business! There is so much more than meets the eye with blogging - communicating with brands, drafting posts, photography and most of all - answering emails and DMs from my followers! I love all of it, but it requires more time than you know! I discovered clean beauty a few years ago and there was no going back for this former Sephora VIB Rouge card holder. I have always LOVED beauty products. Over the past several years, I have been on a journey of changing my eating habits and choosing healthy, clean foods. Not because I was fearful of what was in my food…but because I love how eating healthy makes me feel! It’s the same for me with clean beauty. I’m not choosing these products because I’m fearful that conventional products will give me cancer (although, the research is very convincing)…but more so because I love how these products make my skin look + feel. And it’s fun for me. I love knowing and understanding what goes into my products. I love real. I don’t love slathering chemicals all over myself. It’s that simple for me. I like to keep it simple…but I also know a lot about the specifics of clean vs conventional beauty. So, we also talk about that here, too. Do you only use clean + non-toxic products? When it comes to skincare and makeup: Yes. Until recently, I would use an occasional conventional eyeliner because I didn’t love many of the clean options. Ever since Kjaer Weis released new eyeliners and their amazing cream eyeshadow (which I use as a liner) - I haven’t needed to use anything conventional. I also still use a drugstore eyebrow mascara because it’s so little product and I haven’t found a great clean alternative. When it comes to haircare and cleaning products - I am still learning so much. I get a lot of messages inquiring about both hair + cleaning and I’m always upfront that I have not found much that I am completely comfortable endorsing. I do love Innersense Shampoo + conditioner. And I wash my clothes with Molly’s Suds. With other hair styling and cleaning products - I feel like I’m still making compromises. I’ll keep looking for great products for you all - stay tuned. Does your husband take your photos? Contrary to popular belief, he does not ;) The good ones are usually taken by Shannon Jean Cole photo and the rest are taken by yours truly. Although, I guess occasionally - if we are traveling - my husband may snap one for me. But that’s rare. More power to bloggers with Instagram husbands… it would be so nice if my husband was a photographer. But he has many other amazing talents and for now, we are stuck mostly with my amateur photography. The thing for me that keeps this little blog going is how much I get to help other women discover clean products that they love. Products that nourish and enhance, not ‘fix’ and ‘cover-up.’ I feel honored that so many of you look to me to help you on your beauty journey. My word for the year in 2019 is FREEDOM. I want to be FREE in my journey as a mother, wife, daughter and friend. For me that means, living who I really am without unrealistic expectations that I have placed on myself to be some version of ‘perfect.’ I will mess up and I won’t have it all together and that’s ok. In this space, I want to be free to be whatever kind of blogger that I want, not what I think I ‘should’ be. And mostly, I want to be FREE to be who I was made to be. Who God made me to be. And I’m excited to see what 2019 will reveal about that. You can adopt my word or I’d love if you would share your word for the year on my Instagram post! Thanks for joining me in this journey! I have so many fun things planned for 2019. Get excited!! Alright gals, here’s my TOP PICKS for holiday gifting (and receiving) this year! It was so hard for me to keep a narrow list, so I’m sure I will be adding some MUST HAVES! Keep checking back. And feel free to email me or DM me for personal recommendations! The Detox Market ‘Best of Green Beauty’ Box - I could not have curated this box better myself! It is stuffed full of legit green beauty faves, and a steal at $150! The Detox Box Subscription - the gift that keeps giving! Every month keeps getting better with their collabs! Petit Vour Box Subscription - $18 per month to try green beauty faves! Kreafunk BGEM Wireless Headphones - I am really hoping to have these under my tree! Bluetooth, cordless and pink! ABLE Large Leather Pouch - $38 right now with code ABLE30. I am going to use mine as a cosmetics case. Necessary Neutrals Eyeshadow Palette - The ONLY eye palette you’ll need this year. UGG Robe - I have this robe and it is the warmest, comfiest robe…and lightweight. UGG Slippers - LOVE my slippers. Mine are in the color Fawn and make me so happy. Kjaer Weis Palette (with refills!) - This. palette. Perfect for the minimalist makeup gal. Traveler or all around busy gal! MUN Aknari Brightening Serum (use code ROSEWATER for 15% off) - My fave serum for all over face and doubles as an eye serum. OSEA Ocean Cleanser - My new favorite cleanser. Removes everything without overdrying. Glass Packaging. Smells amazing. It’s love. Ilia Last Night Holiday Set - a gorgeous color palette and a deluxe size of the amazing Limitless Lash Mascara! Travel Jewelry Case - Gorgeous, classic piece to keep your jewels organized. On my own list, for sure! Aillea Stocking Stuffer Bundle - Just $38 for so many green beauty favorites! Jade Roller - Here’s to great skin in 2019. I love this tool for facial massage, lymphatic drainage and looking AWAKE. Gua Sha - I vote Contoured Skin for 2019! Transforming Duo - The best everyday lipcolor. Literally ANYONE would love this set. The lipcolors turn into the perfect pink for your lips. Innersense Pure Holiday Trio - So many of you have been wanting to try my FAVE HAIRCARE. This is the best way to try it…without the commitment! Olika Hand Sanitizer - Flu + Cold season is here. This is the cutest little natural hand sanitizer…complete with wipes on the bottom of the birdie. Kosas Color Trifecta Lipcolor - If you don’t already own the Kosas Lipcolor in ‘Rosewater’ - here’s the best way to make it yours! Paired with 2 other beautiful lipcolors. Ilia Limitless Lash Mascara - Everyone’s favorite clean mascara. Lipgloss Vault - Mini versions in the most beautiful colors. Non-sticky and slightly pepperminty. Lalabu Postpartum Leggings - These high-waisted leggings are a dream for a new mama. Hatch Beauty Belly Besties - Skincare for your beautiful belly. This set just makes it fun! Nursing Bra Set - My favorite style maternity/nursing bra at such a good price. So comfy! Instant Awakening Trio from Beautycounter - Hello, gorgeous + glowy skin for a tired mama. These products seriously make a difference! Jade Roller - Confession: I’m taking mine to the hospital. I was so swollen after having my first…there’s a reason why you haven’t seen any hospital pics of me! This will help in the hospital and beyond! Happy Holidays! Excited for you to get + give some new green goodies! It’s that time of year…to get the best deals from all of your favorite brands! Below, I’ve listed each shop, details of their sale and my TOP PICKS! Sale runs Thursday through Monday, see discounts below! , save 15% off SITEWIDE! PLUS get FREE shipping on all orders over $50! Kjaer Weis Cosmetics - this is a great time to fill your KW Palette! Daily Face Essentials - A great way to try out this amazing skincare line! Yesterday, I posted a tutorial on Instagram using my Kjaer Weis Makeup Palette (LOVE!!). It’s saved in my Instagram Stories under ‘Kjaer Weis.’ So many readers were interested in learning more about the Palette, so I created this Guide to show you everything you need to personalize your own! I also had the opportunity to learn from the creator of the Kjaer Weis line, Kirsten. She did an event at Aillea in Atlanta and she is just the best. This line is truly intentional - created to act as skincare with color (heart eyes) and the packaging is just absolutely drop dead gorgeous! See below for everything you need for your very own palette! 1. This is the palette that you will need, so you can fill it with all of the makeup goodness! 5. I apply Foundation, blush and highlighter with a Beautyblender (currently 15% off at Sephora). The key is to wet the sponge a little first with either water or toner! That's everything you need to fill your palette! Here are some other KW products, to complete your look! - KW Beautiful Oil This oil and the foundation were formulated to work together. The oil adds to the beautiful coverage of the foundation. You want to make sure you skin is hydrated before applying the KW Foundation! For reference, the colors in my palette are the following: Foundation in Paper Thin, Blush in Desire Glow, Highlighter in Ravishing, Lip Tint in Dream State, Eyeshadows in Magnetic and Wisdom. Email me if you need advice on your own colors! I had so much fun at a Bridal Shower Brunch this past weekend! It was finally a little chilly, so I got to throw on my favorite fur vest over a maxi dress! Vests can be a preggo’s best friend in these in-between climates because coats often feel to heavy, but you just need an extra layer! I loved my fresh makeup look, too! Hopefully, this is one of my last maternity looks for a while and we meet baby boy soon!! I shared some really fun little makeup tips + tricks on my Instagram Stories today and here’s the list of everything that I used! You have to check out my little lip trick and how I apply eyeshadow to make eyes pop! I saved the routine in my Stories Archives under “Fall Look.” I hope you like the little ‘get ready with me’ and found some fun ideas for Fall makeup! Eyebrow: Beautycounter Brow Pencil / I want to get this one. 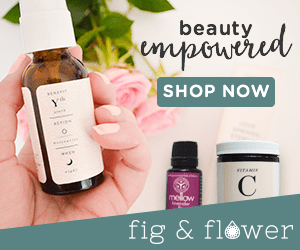 Empties and Clean Beauty Must Haves! It’s finally cooler here in Georgia and it has me thinking through my skin + haircare. What do I need to change up and what will I continue to use through the colder months? My empties are getting replaced because these are my tried-and-true staples. I think you should try them, too!! This is the best clean shampoo and conditioner that I have ever tried. My hair doesn’t get weighed and down and I can style it like I always have with conventional shampoo + conditioner. A little goes a long way and this set has last me forever! The absolute only natural deodorant that works and doesn’t break me out. Period. I’m going to pick up one for my husband and one for myself from Aillea today! Ok, when I started to list the MUST haves, there are so many that I want to include! Ah, so I limited myself to 6 things that I’m absolutely loving right now! My girlfriends are all obsessing over this mascara…and evidently everyone else is too! It’s been consistently sold-out, since it’s release earlier this year. Hurry and grab one! Ok, I know I have included 2 highlighters on this list, but what can I say? This far along into my pregnancy I need all of the glow and these products are really helping me out. This Highlighter palette is beautiful, natural and again - getting me all of the compliments ;) I like to set my undereye concealer with the shade Halo for an extra AWAKE look! Speaking of AWAKE - THIS SET. My love, the Overnight Resurfacing Peel, an Illuminating Cream and Eye Masks?! Hello, GORGEOUS, MERRY + BRIGHT! Do you guys know how important exfoliation is?! You’ve GOT to do it a couple of times a week. The sloughing off of old skin to rejuvenate new (YOUNGER) skin is SO important! If you don’t have an exfoliator - get this one!! It’s also a cleanser (hello, less steps), doesn’t overdry and smells like a spa. So yeah. I pair it with my Overnight Resurfacing Peel (see #4) and have the freshest skin the next am! What are some of your Clean Beauty Must Haves?? You NEED this haircare deal!! OK, I generally don’t make statements like “you NEED this” but everyone asks me about haircare and this The Detox Market October Box is SUCH a great deal for my favorite clean haircare line, Innersense. It’s absolutely the BEST way to try out Innersense haircare - 5 products ($132 value) for $49.95. If you sign up for a 6 month subscription to The Detox Market Boxes, it’s only $39.95/month!! This box is available now, only until supplies run out - RUN! I use the Pure Harmony Hairbath (shampoo) + Conditioner every. single. day. and it’s my favorite! I haven’t tried the other products yet, but I am so excited for them and my box has already shipped!! The Hairbath cleanses my hair and leaves it silky soft. The conditioner moisturizes, without weighing down. If you’re in the market for a clean haircare line, I cannot recommend Innersense enough!! Order your October Innersense Box here. You do not have to purchase a subscription to get this box, you can order this box only!! Eye treatments are one of the most important things that we all should be doing every day for our skin - morning and night! The skin around the eye are is very sensitive and requires a little extra care. Not only will you notice a decrease in concerns like dark circles, fine lines and puffiness - but you will find lasting results with continued use of an eye treatment. I also can’t put on concealer without some sort of eye cream or serum under my eyes. My eyes get too dry and concealer is applied much more smoothly, if I have treated my eyes first. These are my all-time faves. This serum is highly concentrated and formulated specifically for the delicate eye area. The ingredients are incredibly nutrient-rich and you will notice SUCH a difference with this serum. It brightens and tightens and it’s JUST SO GOOD. I use it am and pm. My eyes look better when I wake up. My concealer goes on smoother. It’s just that amazing. This silky cream is all hydration. It conditions and brightens with algae + caffeine. This eye brightener is so good for the colder months. I put it on like lip balm. Give me all the hydration. I’ve used this little guy for years. Anti-inflammatory green tea helps de-puff and coffee aids circulation. Rosehip to nourish, so you look more awake + youthful! I have so many friends that use and love this little eye cream. If you only buy one skincare product this month, this is it. MUN Skincare is hands-down the favorite skincare line for my readers. From their AMAZING Aknari Brightening Serum to the Anarose Toner that I'm obsessed with, this minimal and pure line is absolutely one of the best. MUN has just released a new product and it is a MUST HAVE for EVERYONE. Enter the AMAN Protect + Revive Moisturizer. (Released Today, Friday September 7th!) It's not too thick, not greasy and the perfect amount of moisture. It has a lotion-like consistency and it will absolutely save my skin during the drier months that are upon us. I had the chance to speak with the founder, Munemi, earlier this year. See that post here. We went over all of the MUN products and I was so impressed with the intentionality that goes into her products. And then you try them and they really perform! Aman Revive + Protect Moisturizer is the perfect addition to the MUN Skincare Regimen. If you are looking for a creamy moisturizer - this is it! "Aman is Berber for “water,” evoking the moisture retaining abilities of the desert harvested botanicals that inspired this hydrating gel cream. Formulated with Niacinamide (Vitamin B3), vitamins, and antioxidant rich desert harvested extracts among other key ingredients, this protective moisturizer improves the skin’s barrier function and increases moisture to effectively brighten while boasting anti-aging and anti-pollution benefits. Hyaluronic Acid - hydrating, firming"
Make sure you grab you grab your own Mun Aman Revive + Protect Moisturizer for the cooler, dryer months ahead and don't forget to use my code ROSEWATER for 15% Off! Lately, I've had a handful of women that are around my age telling me that they want to START taking care of their skin. I'm always a little stunned in the moment, because skincare has been on the radar for me for quite a while. Most of these women have also never dealt with problematic skin, so when they start to see their skin change in their 30's - it's really the first time they have thought about skincare. I have dealt with breakouts since I was a teen, so I have had an am/pm regimen for as long as I can remember. And then I turned 30. And it seemed like overnight, I had different skin issues. My overly oily skin was now dry. I rarely have a breakout, but I'm noticing some fine lines. I've had to totally re-learn my skin. And getting to know your skin does require a little effort, but it does not have to be overwhelming. Friends, IT'S TIME to start taking care of your skin. I've created this little guide to help you! In order to care for your skin, you have to take a minute each evening to think about your skin. It doesn't have to be super in-depth. When you get ready for bed, just think for a second - "how's my skin doing today?" Is it dry? Is it broken out? Does it feel heavy + congested? Then, tailor your routine that evening to address your concern. You should be washing your face every night. Yes. Every single night. Do not sleep with your makeup on. If you didn't wear makeup - do not sleep with your sweat/pollution on. I love to use an oil cleanser because it doesn't dry me out and helps to remove everything. My favorites are One Love Organics Vitamin B Cleanser and MUN Akwi Purifying Cleanser (Code ROSEWATER for 15% OFF). Lately, I've been using the Beautycounter Charcoal Bar (so good!) to help combat my pregnancy breakouts. And if you suffer from skin conditions like Perioral Dermatitis, the Black Clay Soap from Osmia Organics is great. FYI - I personally do not use a cleanser in the morning. I will splash with water or a toner and use my Jade Roller for plumping! I don't like to wash of all of that hard work that my products did throughout the nighttime! This is so important. Exfoliate. You must exfoliate. When you exfoliate, you slough off old skin and your body creates new skin. This is often referred to as cell turnover. Skin cell turnover is so crucial because it requires your body to create new (younger) and fresher skin. Exfoliation also unclogs pores, so your skin is more even + balanced...with fewer breakouts. I recommend exfoliating 2-3 times/week, based on your individual skin. Once you learn to assess your skin needs and see the difference exfoliation makes, you'll be able to decide how often you should personally exfoliate. Toning is the forgotten step. But it's SO IMPORTANT. It's all about bringing balance back to your skin. I really only use one Toner - the Mun Anarose (code ROSEWATER for 15% OFF). You can read more about it here. I'm sure there are a lot of other great toners out there, but this one has been specifically formulated to bring your skin back to it's natural balance of a pH of 4.8. I think it's great. I simply apply to a cotton pad and swipe it all over my face. I also mist it at any point of the day when I need added hydration or brightening. It seems like there are so many moisturizers, serums, oils and lotions...do how do you choose? Test them. Order samples or travel sizes. Go into your local green beauty boutique and ask for a sample! They are usually an investment, so find what works for your skin. My TOP PICK is the MUN Aknari Brightening Youth Serum. See more of my thoughts on it here and receive 15% off with my code ROSEWATER! The other product that I reach for in my cabinet most often is the Beautycounter Balancing Facial Oil. This one is great if you deal with breakouts AND dryness! It seems counter-intuitive, but adding good oils back to your skin helps combat breakouts. A lot of times, breakouts occur when our skin is too dry and our body overcompensates by producing oil to help hydrate your skin. This overproduction of oil can cause clogged pores and lead to those nasty white + black heads! So, moisturizing is super important! Also, drink water. Hydrate from the inside out. If creams/lotions are more your thing, I get it! It's so hard to make the switch to an oil when you've been moisturizing with a cream your entire life. For a cream, I like One Love Organics Skin Dew. Eye care about your skin. Eye care. I think this is the number one most overlooked step that's so crucial. You've got to apply eye cream day + night!! My top fave is the Maya Chia The Eye Achiever! It's a serum that's a magical miracle worker for fine lines and dark circles. For a cream on really dry days, I love the Beautycounter Rejeuvenating Eye Cream. And my favorite little economical bombshell is the 100% Pure Coffee Bean Caffeine Eye Cream. Go get a facial and do them at home. - Leahlani Mermaid Mask - it's like a nourishing green smoothie for your face! - One Love Organics Love + Charcoal Mask - it's detoxifying and nourishing all at the same time! - Orgaid Organic Sheet Mask - Plumping and super moisturizing! Interested in a personal clean beauty skincare consultation via Skype or Facetime? Email me here. I'd love to help you find the best products for you! I posted this photo in my Stories recently and received a lot of questions about which products I used, so I thought I would post a comprehensive list of all the goodness. First of all, if you haven't gotten your hands on the Overnight Peel that I've been raving about... DO IT! It's such a gamechanger for your skin, which means LESS MAKEUP. And I don't know about you, but when it's scorching outside - the last thing I want to do is wear heavy makeup. I literally keep forgetting to wear makeup because I'm so happy with how my skin looks! On this day, I had used the PEEL two days before. My skin was still great and I just needed minimal makeup to enhance my look. I originally posted the photo to rave about my new BLUSH because I loved how natural it was. And it's such a great color that you can wear with anything because it doesn't lean too far into any hue. It was great with my bright pink dress! Kjaer Weis Cream Foundation in Paper Thin - applied with my Beautyblender. I love this foundation for it's beautiful finish and buildable coverage. Kjaer Weis Cream Blush in Desired Glow - The blush that goes with everything. A little tawny/bronzey with a hint of pink. A blush you can wear when you dress in pink ;) I apply with my Beautyblender. Beautycounter Eyeliner in Black - Doesn't smudge and lasts for hours. Honest Co Mascara + Primer - I love this mascara for the primer! Helps my barely there lashes stand out! MY FAVORITE NEW HIGHLIGHTER: RMS Luminizer in Champagne Rose - It's the most natural highlighter I've ever used. Just looks like dewy skin! Kari Gran Lip Whip in Pink Tinted - My go-to lip balm! Look like you just had a facial! There is nothing like day-after-a-facial skin! When we were engaged, I got professional facials every 4 weeks and my skin never looked better! I have never had any procedures done - just a facial and a peel whenever I can find the time to go. Now, I can do the PEEL right at home - with the same results (well, minus the soothing music, massage and professional esthetician). I posted this photo and a video in my Instagram Stories over the weekend and got so many messages...and orders! For a product that works this well, I think the price point is fantastic! To apply, spread 1-2 pumps on a clean face before bedtime. Allow product to sink in and then apply moisturizer/oil/serum. You can do this 3-4 times/week and it can even be applied every night! In this photo, it's not totally naked skin - here's what else I have on! But, the peel is SO GOOD and I was SO HAPPY WITH MY SKIN that I forgot mascara for the day! MY FAVORITE NEW HIGHLIGHTER: RMS Luminizer in Champagne Rose - It's the most natural hightlighter I've ever used. Just looks like dewy skin! I hope you try the Overnight Peel! I really think you will love it as much as I do! I get a lot of questions about "pregnancy safe" products. The good news is that a majority of what I post is great for use before, during and after pregnancy! Here's a short list of ingredients that all communities agree should be avoided during pregnancy. You may have heard 50 times by now that you should be using a natural deodorant. I know - the process of finding a natural deodorant is an unfavorable one (especially in the summer time) - but there are so many great options now! If you are pregnant, I really urge you to consider it! Conventional deodorants contain aluminum + other endocrine disruptors and if you're pregnant - you should think about these metals and toxins leaking into your glands...right beside your milk glands! Natural deodorants are not anti-perspirants, so you will still sweat. BUT sweating rids your body of toxins - it's a natural and essential process. I'd rather sweat out my toxins vs. hanging on to them and having the toxins potentially reach my baby. I recommend a few deodorant brands - but I'm loving the NEW Agent Nateur Holi(stick) Sensitive Deodorant! A great resource to read all about things to consider when it comes to Immunity and Health for pregnancy through the teen years is the book, The Vaccine Friendly Plan. We did not necessarily follow their vaccine plan, but this book is full of information about a healthy pregnancy and details each vaccine (its history, use, ingredients, side effects). The doctors even describe what exactly endocrine disruptors are and why to avoid them! Whether you decide to vaccinate or follow a different a plan, this book is a great resource for pregnancy and beyond - I align with so much of what they say! They talk about aluminum and deodorants in Chapter 1! I created a lightweight summer makeup look using all of my newest loves! This entire look (except for mascara) is available at Aillea Beauty.